The Small House layout is the most basic version of a personally-constructed home you can create. Once the Main Hall is built, you can remodel this part of the home into an entryway. See the Main Hall page for details. Upon construction it will contain a chest, which is safe to use and will retain its contents even after remodeling, as will all the other storage containers (apart from the satchel). 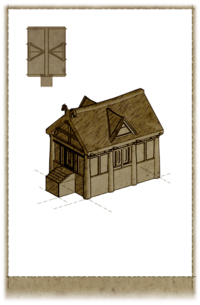 The following is a list of possible furniture items and decorations which can be added by using the carpenter's workbench in the small house. It is not necessary to purchase or build all furnishing options; you can pick and choose to better dictate style. However, all furnishing options are in a pre-arranged location and only ingredients and standard items can be moved. Oftentimes, the name of the furnishing option only indicates the primary piece of furniture, and actually includes various additional containers and accessories. A number of miscellaneous items are added with various furnishing options, but only notable items are specified on this table. This includes usable containers, any food or ingredients on hanging racks, or items which can be used for crafting activities. Though they are added to your home, other common items and ingredients are not listed here. Note that the icon displayed for each furnishing option does not necessarily represent what is actually built in your home. If you're planning to build a full house and remodel the small house into the entryway, you may want to hold off on some of these. While some of the items are retained as they are, or get moved to other parts of the house (notably the Double Bed will be moved into the bedroom upstairs), others are lost, and thus a waste of materials. In particular the satchel from the "Wall Shelves" option (above the chest) will disappear, along with anything in it. The other containers are not affected and are safe. Most of the containers are available to build after remodeling, except the end table, so you may wish to construct it beforehand to gain an extra container (but see note below table). Barrels Sawn Log, Nails, Iron Ingot One at southwest corner with two sacks. Wall Shelves (3) Sawn Log, Nails East wall, back. West wall, back. Adds one satchel. †This end table is removed by the UHFP and related mods in favor of a bench that occupies the same space. This page was last modified on 20 November 2018, at 23:12.